The inspiration? A line of text on a blog somewhere that said something like: “marinate kale in coconut milk for four hours, then grill”. You know that went to the TOP of my “To Make” List. And then I went researching, and found that there are all sorts of “grill kale marinated in coconut milk” recipes on the Internet. 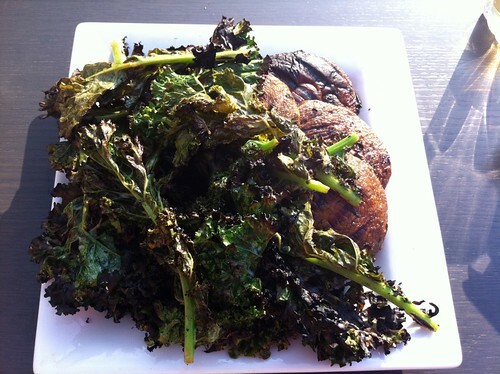 In fact, Vij’s Indian restaurant in Vancouver is famous for their kale. And their recipe is online in a number of permutations, including in this New York Times article. I don’t have a BBQ, so I’ve been saving up this recipe for a while, until we were invited to visit friends with BBQs. 1) They invited us over. 2) They have a barbecue. 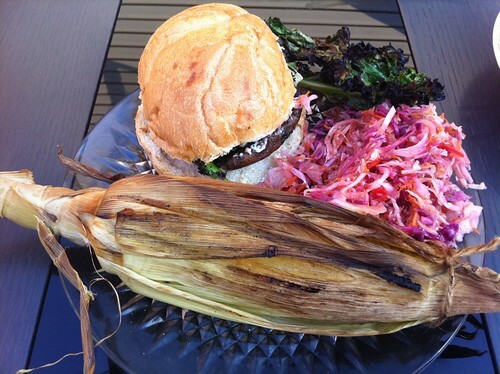 3) They asked us to bring a veggie side dish. 4) They love coconut milk. 5) They are almost as obsessed with kale as I am. So over we went, with some marinating kale in tow. And a couple of beers. Perfect for a lazy weekend afternoon. Which was only made better when I was promised veggie burgers. Which is only better when it’s a grilled portobello mushroom on a bun. Which is only better when you add Brie. 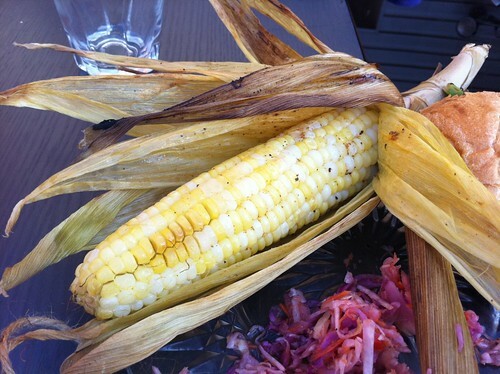 Yes, summer perfection — along with corn grilled in the husk and the best red cabbage slaw ever (apparently the secret is celery seed, go figure). 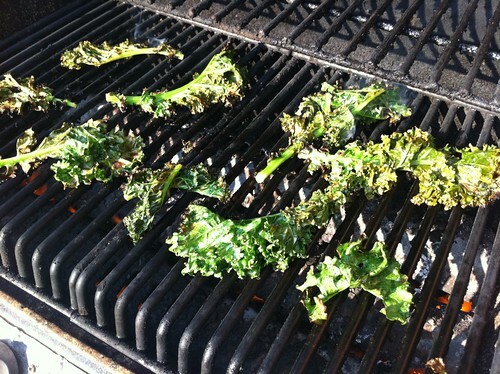 Until you can get yourself to a BBQ, I recommend my Kale Chips. But as soon as you can grill outdoors, you need these. 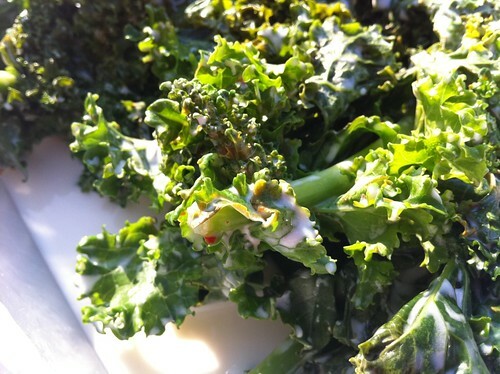 Wash the kale thoroughly and tear the leaves off of the stalks. Pat the leaves dry with a clean tea towel, or use a salad spinner. 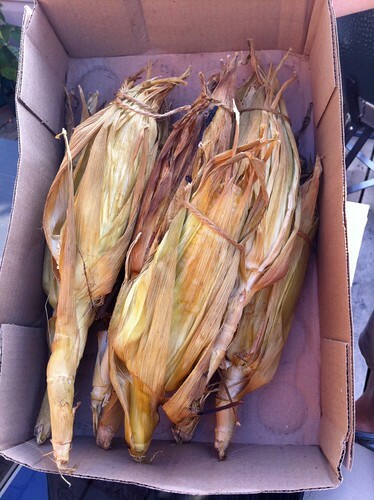 Discard the stalks (or save for soup!). In a pot over low heat, warm the coconut milk until it is just lukewarm. Transfer to a pyrex dish and add the salt, cayenne, paprika, chili flakes, and lime juice. Stir to combine. Add the kale and cover the leaves completely with the marinade. Cover and refrigerate for 4 hours. 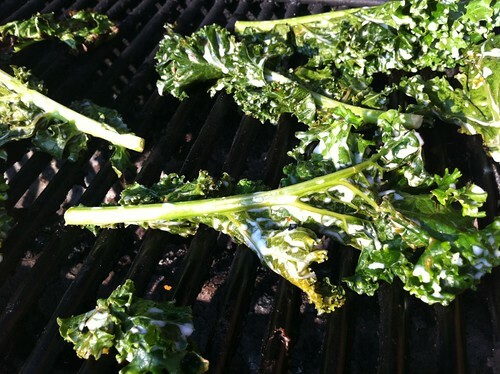 On your preheated BBQ, use tongs to arrange the kale leaves in a single layer. 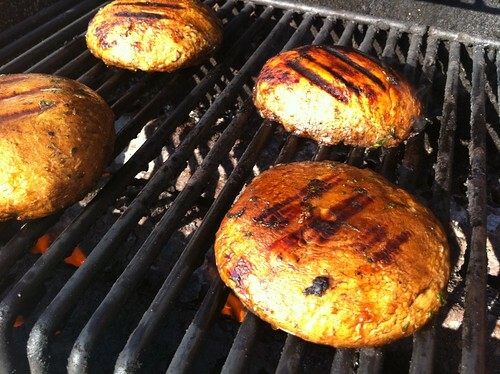 Grill for 45-60 seconds, flip over, and grill for another 45-60 seconds. You are aiming for the consistency of soft centres and crispy edges, not 100% charcoal leaves. Serve immediately and crunch away! 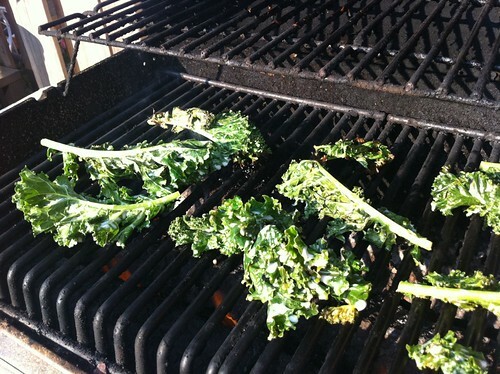 Never thought of grilling kale. Great post and fantastic pics! Wow – so creative! How are they compared to kale chips? I’d say they are more ‘nuanced’ than kale chips — you get more softness in the centres along with the crispy edges in the grilled version rather than all crispy in the oven… and you get the smokey barbecue flavours, which I quite like. These were supremely amazing on top of my portobello burger, and had a lot more flavour than the kale chips, I think. I’m so jealous of your kale and those portobellos OMG, we can’t get those here. I’ll send you some figs if you send me some kale & portobellos!! We tried this kale recipe last week and quite enjoyed it. I’m warming up the barbecue right now for the first time since making it, and there’s a fantastic coconut scent to the smoke coming off of it.